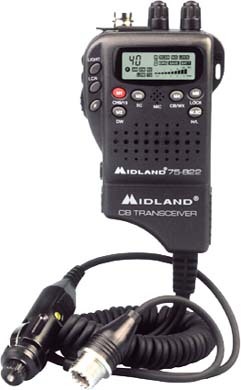 Super low prices on handheld cb radios like cobra hand held cb radio, midland & cherokee. Cobra hh38wxst hand held cb radios & cobra 75wxst hand held cb. hand held midland cb. Our hand-held Cb raidos have a 1 to 2 year manfactures warranty. Tuning is not available for hand held cb radios. *For the AC adaptor see item #1453 below. *Vol,sq,channel selector,mic & speaker all in the handset. *The handset is connected to a small box(2"" x 3"") that your antenna and power cord plug into. *The box is usually mounted under the dash.